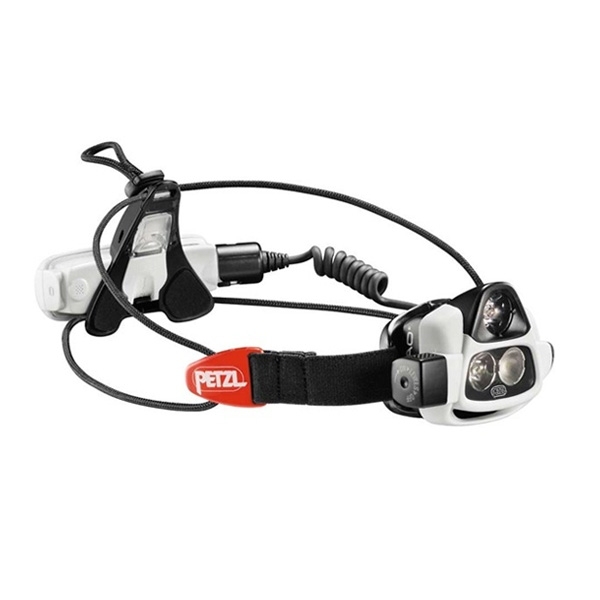 The rechargeable Petzl NAO Head Torch adapts its two high power LEDs instantly and automatically to the lighting needs for greater comfort, fewer manual interventions and longer battery life. NAO is the first Petzl Head Torch with Reactive Lighting Technology. 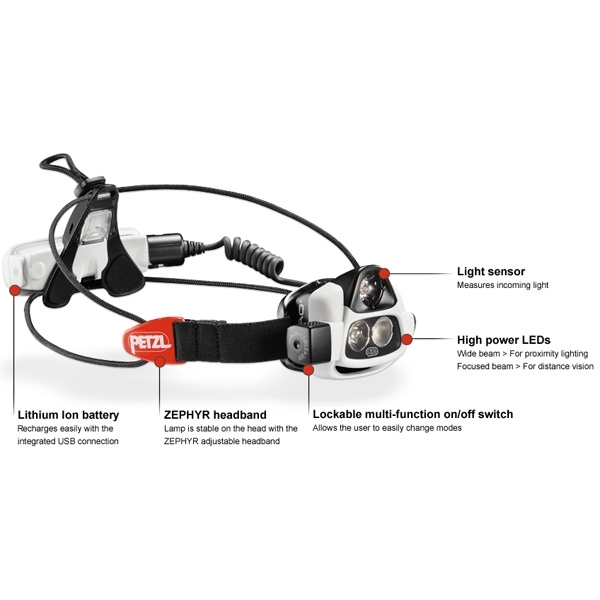 Reactive Lighting Technology represents true innovation and is the Petzl solution which harmonizes lighting power and duration. A built-in light sensor adapts the headlamp's beam pattern and light output instantly and automatically to suit the user's needs. This means the user gets an ideal amount of light with minimal manual adjustment required. This self-adjusting lighting mode also results in longer burn times, due to more efficient use of the rechargeable battery. The shape of the beam and the power of the headlamp instantly adapt to the need (lighting for close, medium or long-range vision), so the user always has the right amount of light. The headlamp automatically adapts to changes in surrounding light conditions, allowing the user to remain focused on the activity at hand without worrying about adjusting the headlamp. Reactive Lighting Technology increases burn time, due to more efficient use of the rechargeable battery. Lighting adapts to suit the need, reducing the use of wasteful, unnecessarily powerful lighting. In self-adjusting Reactive Lighting mode, the light adapts instantly and automatically: full power for distance vision, medium power for moving around, or low power for proximity lighting. This mode optimizes battery use and therefore increases the burn time of the headlamp. For more versatility, personal profiles may also be created according to the user's specific needs. Once the profiles are loaded into the NAO, they are easily accessed at any time.